Just a quick update about where we are this week. The first half of the week was spent at the Douglas Dam Campground not far from the crazy town of Pigeon Forge (if you’ve never been picture miles and miles of road lined with outlet stores, hotels, and millions of signs screaming about Lumber Jack Shows, Go-Cart tracks, old-timey photographs and every other tourist attraction known to man. Then amplify whatever you just imagined by 100 times — that is Pigeon Forge). Thankfully the campground had none of that. Just a lake, a dam, and some basic RV sites with electric and water hook-ups. We only stayed three nights, and other than walking around the campground a few times we didn’t do much. We didn’t even get out for any kayaking despite the fact that the sun made an appearance on the second day. Sometimes that’s just how is goes. On Wednesday afternoon we moved over to Fall Creek Falls State Park. 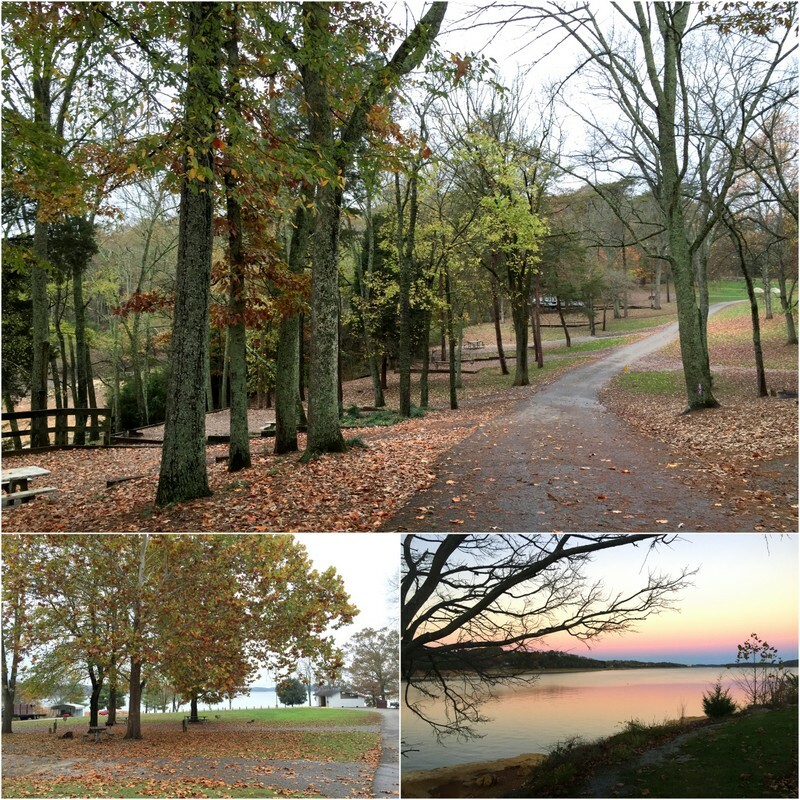 This is another great Tennessee state park with tons of hiking trails, multiple waterfalls, a small lake, and lots of other ammenties like ball fields, a swimming pool, and even an on-site restaurant. While its 200+ sites are nowhere near full, we were surprised by the amount of RVs, and even a few tents, scattered around the loops. With temps in the 50s during the day and 30s at night this is not exactly prime camping season. Judging by the amount of guys we’ve seen outfitted in camo, and that one dude I saw with a giant bow and arrow, we suspect the popularity of the park right now has more to do with hunting season than camping season. Okay…I just looked it up. Right now it’s Muzzleloader and Archery season, and hunting is allowed in the park. Hmmm…I guess we need to wear some bright colors on our next hike. Speaking of hikes, we did a big loop yesterday afternoon that took us past three waterfalls. The last one was Fall Creek Falls. This 256 foot high waterfall is tallest waterfall east of the Mississippi. Considering the amount of rain that has fallen around here lately we expected it to be a bit more impressive. I guess that’s what happens when the waterflow for tallest waterfall in the east is restricted behind a dam. We’ll be here for a few more days and plan to get out for more hikes and hopefully a kayak around the lake. Hunting season definitely freaks me out a little since we’re out in wilderness so often. 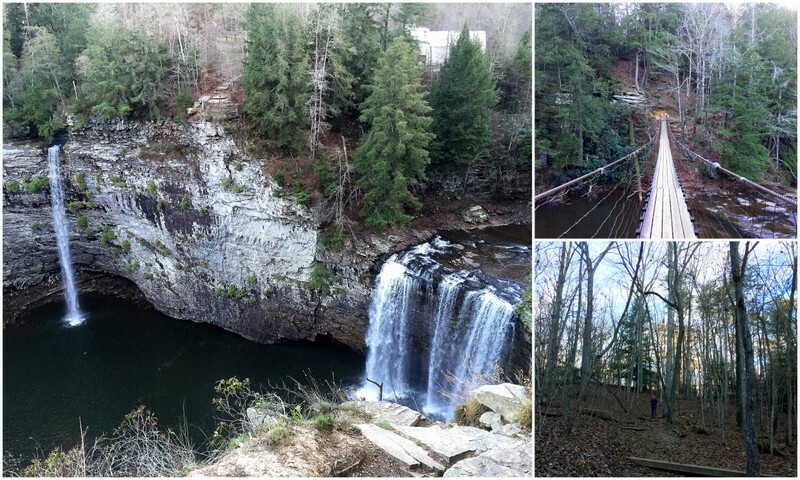 Looks like some nice places to camp though…and boy, Pigeon Forge sounds icky! You would think that a human in the woods looks nothing like a deer in the woods, but sadly that does not appear to be the case :( And yeah, Pigeon Forge was ridiculous and kind go gross. Well, I can definitely cross Pigeon Forge off of our list. Hiking in parks where they allow hunting always makes me uneasy — and unfortunately, orange is not my best color. Yup, don’t bother with Pigeon Forge unless you want to catch a lumber jack show or do some outlet shopping. It was quite a shock to come upon after driving through the gorgeous Smoky Mountains. We are at the same State Park AND we are just a few sites away from you….we are the Lazy Daze (blue and white and retro looking) and you might have noticed us as you drive around the loop to your site. We saw your rig and I thought Hhhmmm bet they are full-timers (the SD license plate kind of gave it away then ALL the decals from many places) and something about your setup seemed familiar. Found you right away online and realized I follow some other blogs that you also follow. At the moment we’re not full-timers but are in the final stages of wrapping up our “normal” life and will be on the road full-time this coming May. 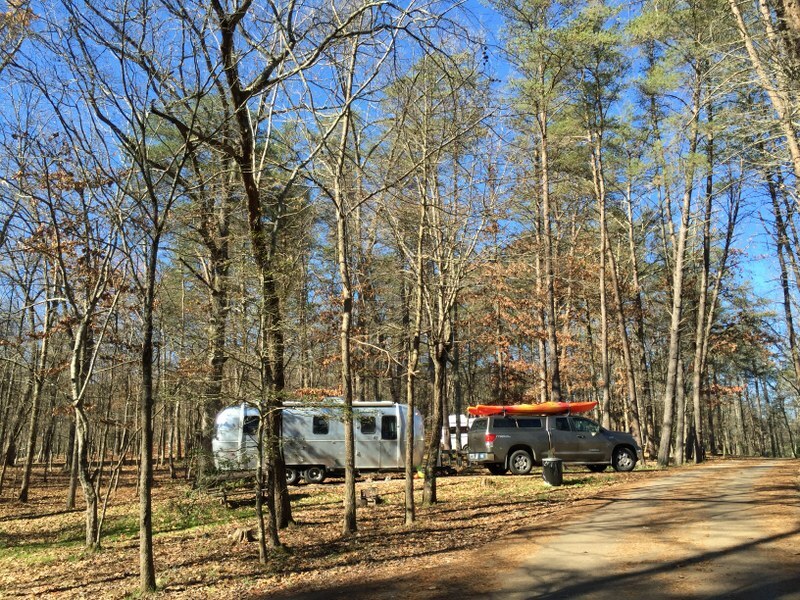 Anyway we’re here till Monday (we were also just in the Smokey Mts and left on Monday) then heading north into KY. We headed out in late October for a month of travel and enjoying the last of this season before putting our rig to bed for the winter. Would enjoy saying Hi in person (not tonight but anytime over the next 2 days) if that works for you but will understand if you’re busy. Hi! We have walked past you Lazy Daze a few times and admired the nice blue color. We plan to walk around the campground at some point this morning and will stop by to say hi if it looks like you’re home! Thanks Jodee. After a few weeks of rain it has been really nice to see the sun again! Truly was great meeting you both this morning. 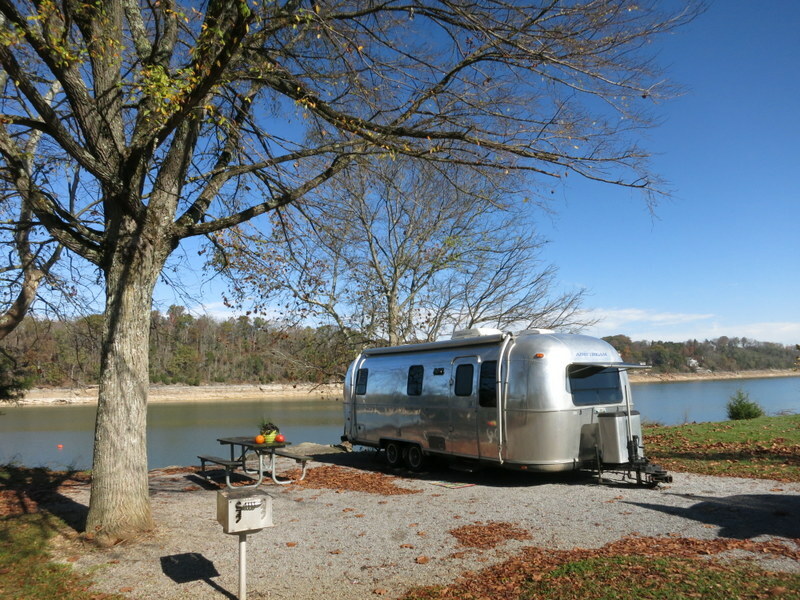 Thanks for showing us your Airstream and setup. Another wonderful sunny day here at Fall Creek Falls but it will be very chilly tonight!! Today was catching up on chores for us which included laundry. Tomorrow we’ll play again. Safe travels and I’m sure our paths will cross again. It was great meeting both of you as well! We loved the Lazy Daze tour and look forward to bumping into again somewhere down the road. Your travels are almost the same as ours a month ago. We took the same Mammoth Cave tour and felt the same about it. Our shock at seeing the excess of bad taste Pigeon Forge must have been similar to yours. 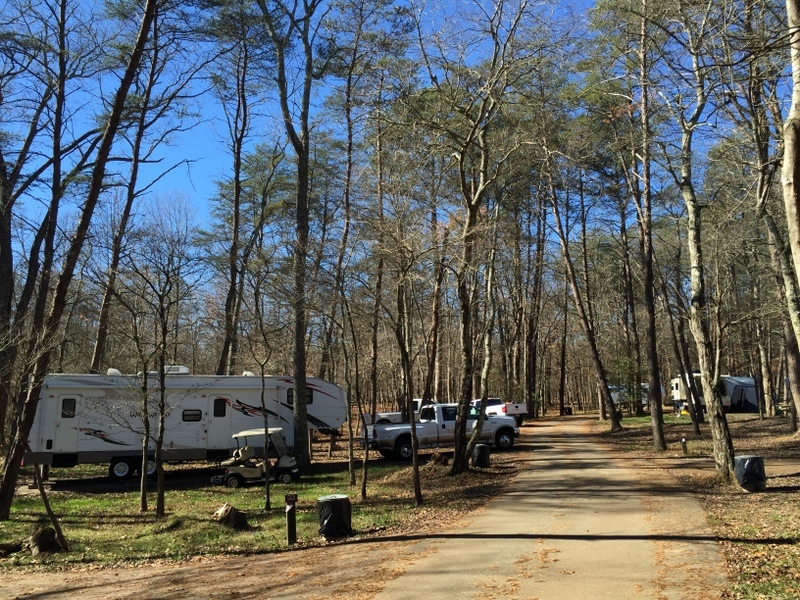 The nice part was our stay at Dumplin Valley RV park in Dandridge, a little known gem. We stayed at Cumberland Mt. S.P. and made a day trip to Fall Creek Falls. After that we went over to the Alumalina rally in SC. Glad to know we’re not the only one’s disappointed by Pigeon Forge. Not sure why a town outside a gorgeous national park has been turned into such a circus. We almost stayed at Cumberland Mtn. instead of Fall Creek Falls. I’ve heard good things about the park. Wow! 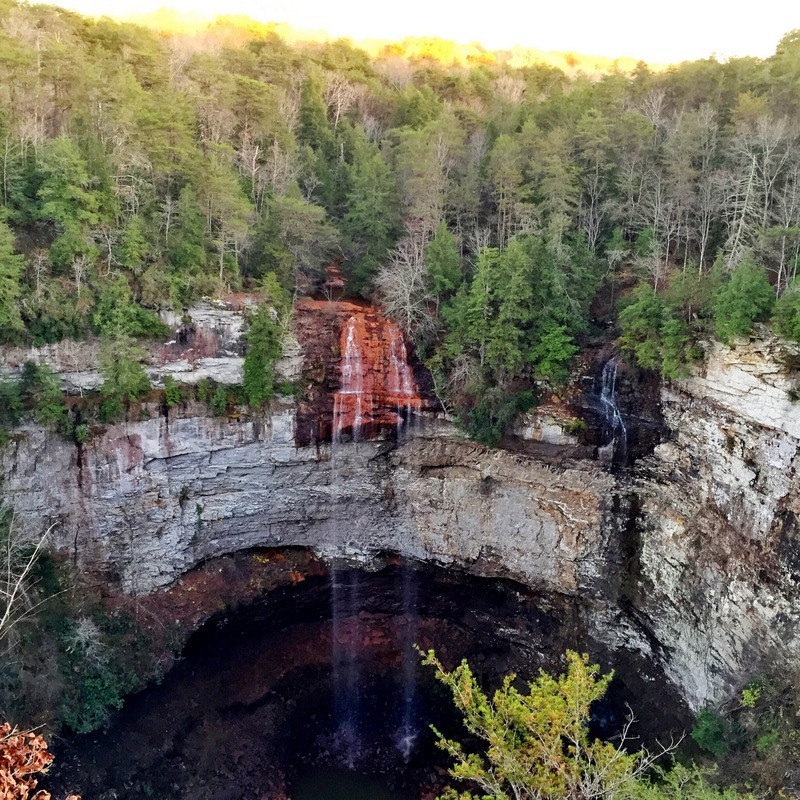 Fall Creek Falls is beautiful. Yeah, it was really pretty and we enjoyed the hike to get there. Hi, I keep seeing your blog pop up lately in various sources I read. We have been to a lot of the same places as you lately. We were in the Smokies the past couple of weeks, but glad we didn’t miss anything by not going to Pigeon Forge. We stayed at 3 TN state parks and loved them all, Cumberland Mountain was my favorite. Fall Creek Falls was one we wanted to go to but didn’t end up there. It looks nice, we’ll have to go another time. I just booked a reservation at St. Andrew’s State Park in Florida for next year and saw a review you posted about it. I’m hoping we can fit in there, I’m second guessing that one now. Anyway, love seeing your travels! So far we’ve really enjoyed all the Tennessee state parks that we’ve visited. A ton of people recommended Cumberland Mtn, but the promise of a waterfall steered us in the direction of Fall Creek Falls instead. I hope you enjoy St. Andrews as much as we did. As long as the site you booked says it’s long enough for your rig you should be fine. Most of the sites were pretty good sized. That campsite looks great! You still seem so far away!! We are still so far away! The plan is to hang around here for another week and then we’re blasting is south and west.